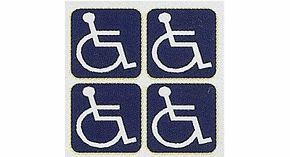 Wheelchair Logo's Interior Car Sticker For Car Window. This Badge was a good buy, I was able to cut it into 4 pieces and put 1 on each of our 4 doors on our car. There were larger Badges, but I find lots of people are so rude, they do not take any notice of the signs, how ever big they are!